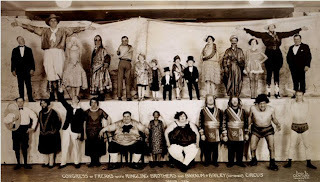 I have come across the phrase "congress of freaks" several times now, most recently in Fiedler, but also in a Donald Platt poem whose title is taken from a photograph: "Congress of Freaks with Ringling Brothers and Barnum & Bailey (Combined) Circus, Season-1929." The poem is [going to be here as soon as I can figure out how to attach it] and the photo is below. As a writer and occasional poet, I am obsessed with words, and the word congress strikes me as rather specific, rather purposeful. I have yet to discover the origin of the term, though a 1914 New York Times review of a Madison Square Garden Barnum and Bailey's Circus performance does mention the "International Freak Congress," which included a "tribe of savages... a very lean and bony man described as 'the human hairpin'... families of pigmies [sic], fat people and tall people... the familar faces of 'Zip'... and 'Princess Wee Wee.'" So, congress seems to have a long-established pairing with the freak show, and it is a word with several interesting implications, not the least of which is that it carries the connotation of something very official, a formal and important gathering. While its most general usage simply denotes a meeting, the more familiar application of the word to government gatherings lends it that formal connotation. In the context of this image, so, too, does the rather elaborate title of the photograph, and such formality seems relevant. I can't imagine that a posed and designed gathering was a frequent occurrence, and the date in the title suggests that it was, perhaps, annual. In addition to the tone of the word is the implication that those at the formal meeting are representatives, and herein lies my most acute fascination with the word, for I see in this image a thorough array of performers-- fat ladies, giants, dwarfs, the hairy, the strong, the limbless-- indeed, a representation of all, or at least most, that the sideshow had to offer. But the notion of representation goes deeper, in that there is a more general representation of society in this image-- men and women, skinny and fat, short and tall, black and white-- these freaks reflect the variety and complete lack of normalcy or standard that any of us who have ever felt different can understand. Put simply, they represent differences that are so vast and so complex that they are indefinable, but still can, however, be represented. Meetings, representations, and, lastly, the definition of congress loosely related to its coital application, but one less graphic and physical: simply, "familiar relations" (dictionary.com). This speaks to me not of sexual familiarity, but of familial familiarity (pardon the redundancy), a notion that most anyone who has studied freaks and freak shows can understand, for among all of those differences lies the bond of family, the bond of common experience and common context that these performers shared. In a last etymological note, I am further fascinated to discover that congress is derived from the Latin congressus, "a hostile encounter" (Online Etymology Dictionary). While a reference to hostility seems to contradict the claim of the previous paragraph, that congress denotes some familial bond, there can be, of course, a certain hostility between audience and performer, between the perceived "normal" observer and the "abnormal" freak. While that hostility has certainly existed and has been documented and expressed in various ways, I turn to an observation of Jeanie Tomaini's in an effort to quell that historic and etymological hostility: "You'd be surprised how many weird people you can find in an audience who think they're perfectly normal." And perhaps that is the real difference between the freak on the stage and the member of the audience: awareness of one's own differences, acceptance of one's own differences, and, dare I invoke it so soon, the "frame of mind" which allows or prevents that awareness and acceptance.